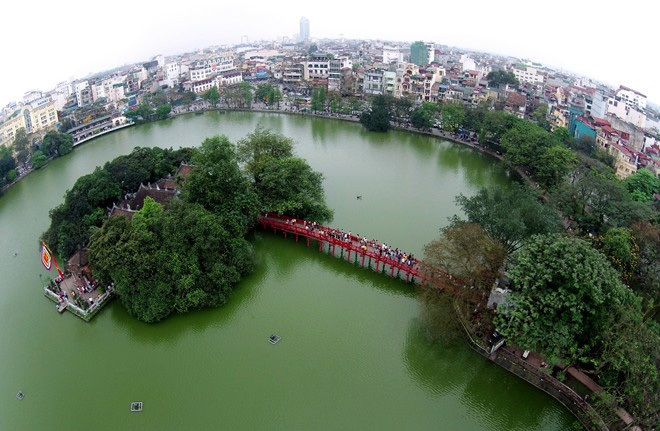 Traveling in Hanoi on a Vietnam trip, you definitely cannot skip Hoan Kiem Lake (also known as Sword Lake). This is considered the symbol of culture in this city in particular, and Vietnam in general. 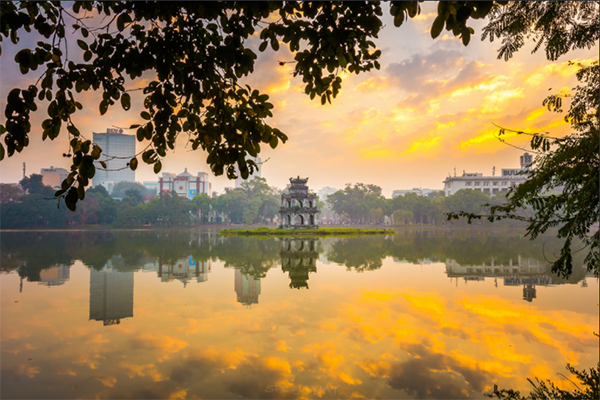 Hoan Kiem Lake has witnessed the Vietnam history with a legendary story passed through many generations. Hoan Kiem Lake is associated with the legend of the sword from King Le Thai To. According to the legend, when Le Loi revolted in Lam Son (Thanh Hoa), he found a sword, thanks for which he picked up a sheath in the field. This precious sword had followed Le Loi throughout the resistance against invaders until the day of victory. Then, Le Loi took up the throne and set up the capital in Thang Long. A long time went by, and when he was roaming by boat on the lake, suddenly a large turtle emerged and swam towards him. It asked the king to give the sword back. The turtle took the sword and dived. Since then, the lake was named Hoan Kiem (returning the sword). Formerly, the lake named Luc Thuy because it has a green color all year round. Up to now, the lake has been called with different names such as Sword Lake or Hoan Kiem Lake. 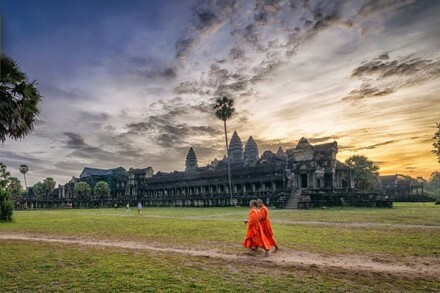 It has become a famous tourist destination, located in an area with many historical monuments such as The Huc Bridge – But Tower – Ngoc Son Temple. Hoan Kiem Lake is located in Hoan Kiem District, surrounded by Le Thai To Street, Dinh Tien Hoang Street, and Hang Khay Street. The area of Hoan Kiem Lake is about 12 hectares, with the length of nearly 700 meters and the width of nearly 200 meters. It is a natural freshwater lake. Around the lake, there are historical relics such as Ly Thai To Statue, Ba Kieu Temple, Hoa Phong Tower. 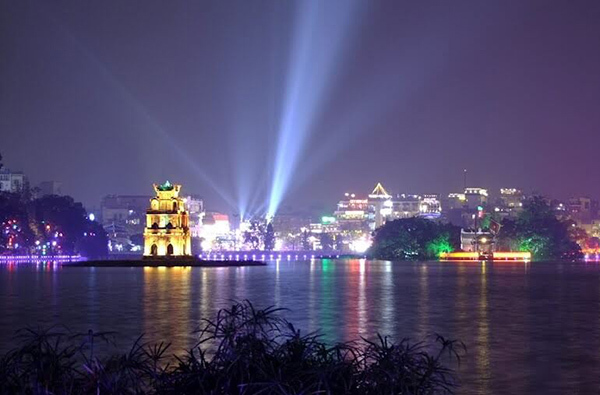 On the lake there are two small islands: Tortoise Island is located at the center of the Turtle Tower, and Jewel Island has The Huc Bridge leading to Ngoc Son Temple. 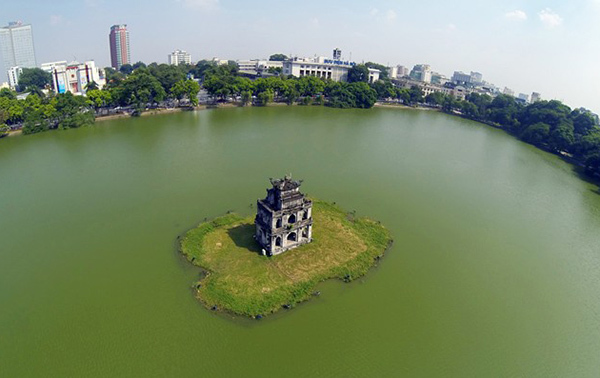 Turtle Tower is located in the middle of Hoan Kiem Lake. The tower has three floors, the lower floor is the largest. The East and the West sides have three rolling doors. In the South and the North, there are two sharp rolling doors. The top has two floors with the railing around, there are four bend swords. 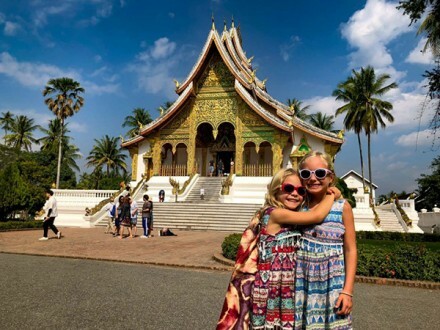 In the legend, the Turtle Tower marks the place where King Le Thai To returned the sword. Next, to it, there is The Huc Bridge crossing over the lake. You will notice it easily in a Vietnam trip. The bridge was built by Nguyen Van Sieu in 1865, with wooden structures and red color. It has a bent shape as the back of the shrimp. The Huc Bridge leads to Ngoc Son temple gate. Ngoc Son Temple is located on Hoan Kiem Lake. The name of the temple’s gate is Dac Nguyet Lau meaning “Moon Floor “. Ngoc Son Temple worships the people who have passed the system of former competition-examinations such as Tran Hung Dao, La Dong Tan. This is a typical example of space and architectural artifact. The harmonious combination of temple and lake forms a unified overall. Around Hoan Kiem Lake, there are many attractions that tourists should visit when coming here. Hoa Phong Tower is located on the East bank of the lake. The tower has three floors. Its doors are divided into the four directions of East, West, South, and North. There are with the Chinese characters such as Bao Duc sect, Bao An sect, Hoa Phong Tower, Bao Thien Tower corresponding to each door. Four sides of the second floor are the eight-sign shape. The third floor has inscribed the words “Thap Hoa Phong”. Ba Kieu Temple is located on the East bank of the lake. It was built from the dynasty of Le Trung Hung. Temples have three brick buildings roofed tile. You can learn about the origin of this relic in your interesting Vietnam trip. The temple worships three goddesses. They were Lieu Hanh Princess, The Second Fairy, and The Third Fairy. 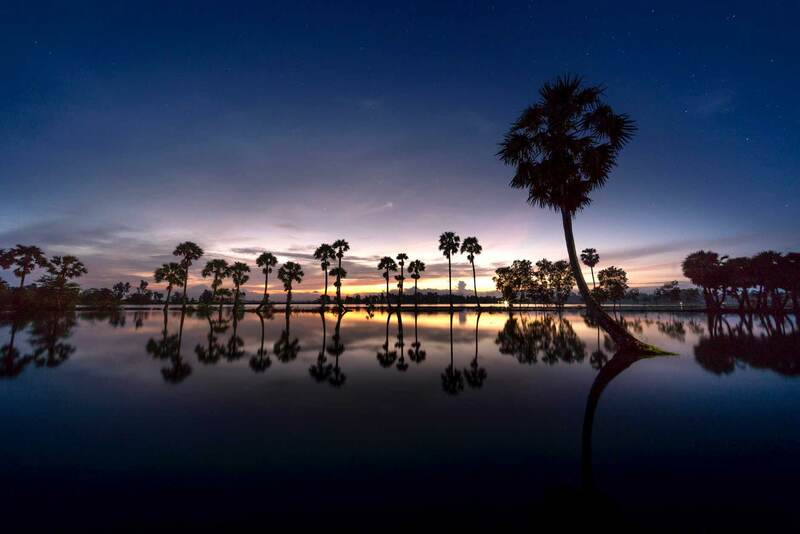 Thuy Ta is located on the Northwestern bank of the lake. It is a special type of architecture in the ancient Vietnamese architecture which started constructing in 1937. This is a place to enjoy the scenery of Hoan Kiem Lake. King Le Temple is on the West bank of the lake, next to the Nam Huong temple. Inside the temple is the statue of King Le Thai To standing on the high pillar and holding the sword as if launching down the lake. Tourists cannot ignore Thang Long Water Puppet Theater. It is quite famous, as a puppet theater located in the center. 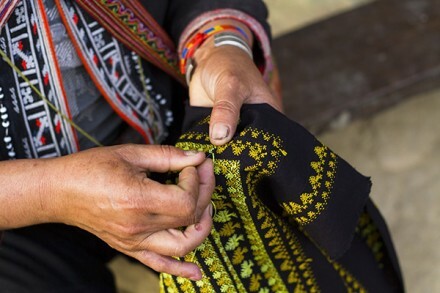 It is very convenient to travel and meet the demands of domestic and foreign visitors to visit and learn about the traditional water puppetry art in Vietnam. Hoan Kiem Lake has strongly attached to the life and mind of many people. The lake is an open space for cultural, fun and sightseeing activities for local residents. Hoan Kiem Lake every morning is the image of middle-aged people or the older doing morning exercise and walking around the lake together. In the afternoon, Hoan Kiem Lake is more crowded with tremendous people going out to play. Children are taken there as well. They hold in their hand’s colorful balloons. In the evening, streets are lighted up and the space around the lake is more sparkling. Somewhere around the lake is the smoke of the hot tea cup or pervasive perfume of some cups of coffee. Hoan Kiem Lake is the ideal gathering place for four seasons: brilliant in peach blossom and traditional festivals in the spring; winds blow away the sultry heat of summer; seduced with the willow branches in the mist of autumn; splendid in yellow leaves and drizzling of winter. Hoan Kiem Lake is also an endless source of inspiration for photographers, writers, poets, and artists. There are many poems, songs, and paintings about the beauty of Hoan Kiem Lake. It has been the topic which went deep into the heart of each Hanoi citizen. And above all, the lake became the symbol of peace and the virtuosic talents of the nation. 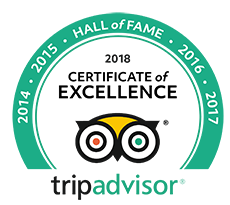 There are many famous restaurants around Hoan Kiem Lake. 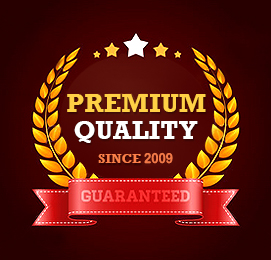 The food here, from snacks to traditional dishes are all extremely attractive. You can eat snacks such as dry beef, finest flour cake, mixed girdle cake of Hang Trong Street. 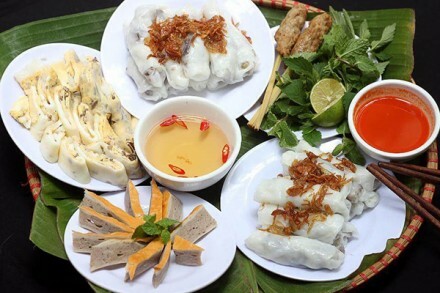 Main meals are also abundant for you to choose such as Hang Bai chicken rice, vermicelli, Ly Quoc Su noodles and bread, all of them are the famous dishes of Hanoi. Coming to Hoan Kiem Lake, you should enjoy delicious ice creams, especially on hot summer days. The two most famous and ancient ice-cream brands are Trang Tien and Thuy Ta. If you want something new, you can choose lemon ice-cream or fruit ice-cream in Hang Manh to enjoy their uniqueness of both color and flavor. Hoan Kiem Lake is always a popular tourist attraction in Hanoi or even in a Vietnam trip. Through a long time of history, Hoan Kiem Lake is now a symbol of Hanoi, like the Eiffel Tower of Paris, the Leaning Tower of Pisa in Italy, the Statue of Liberty of America. Hoan Kiem Lake is the pride of the capital’s people in particular and of Vietnamese people in general.